1.5 miles long with 2 loops. From Muskegon, drive south on US-31 to the Ferrysburg exit. Turn right (west) on Third Street. Third Street bears to the right, becoming 174th Avenue. Turn left form 174th onto North Shore Road. Follow North Shore about 2 miles to Lake Michigan, where it bears south and becomes North Shore Drive. Continue 1 mile and turn left (east) onto Berwyck. The entrance to the preserve is immediately to the left. This site is an excellent example of a sand dune ecosystem. This site contains all stages of dune development, from bare beach areas along the Grand River to climax dune forest. Two trails wind through the interdunal area and along the Grand River shoreline. This site is undeveloped and has few amenities, so come prepared. Dune ecology study groups may make prior arrangements to use the new Dr. Mary S. Kitchel Outdoor Classroom and Restroom. Many different kinds of birds use this area. Excellent probability of viewing large numbers of hawks during their fall migration in September and October. Bald eagles may be seen during winter months. Watch for hawks on days when there is an east wind blowing. Excellent chance of seeing ring-billed gulls, herring gulls, great blue herons, and other water birds. Warblers, woodpeckers, sparrows, swallows, and many other songbirds can be seen at various times from spring through fall. Dawn and dusk provide the best viewing opportunities. 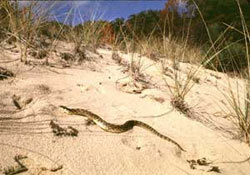 Several kinds of reptiles including hognose and blue racer snakes may be seen during summer. Trails – Connie Lindquist Trail meanders through 3 zones of dune succession. 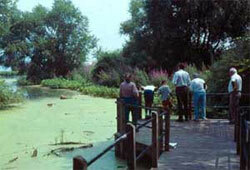 Marjorie Hendricks Trail follows the shore of the Grand River with several overlook rest spots and benches. Both trails are EASY, self-guided with trail guides. Barrier-free – Dr. Mary S. Kitchel Outdoor Classroom & Restroom (open only for educational groups by prior arrangement).